New age travellers living near to the former Sheffield ski village have been told they must leave the site after losing their legal battle. About 30 people living on land off Pickering Road had challenged a eviction notice issued by Sheffield City Council. But a judge at Sheffield County Court ruled in favour of the local authority. A council spokesman said it would work with the travellers to help them move out as soon as possible. Sheffield Ski Village opened in the 1990s but has been derelict since a fire in 2012. In 2017 it was announced the 48-acre (19.4-hectare) plot at Parkwood Springs was to be turned in to a £22.5m extreme sports site. 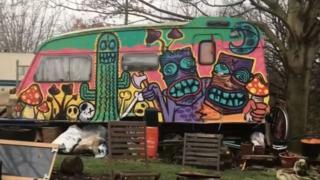 Travellers arguing against eviction said they had lived on the site for more than a decade and as a result had an "implied licence to occupy the site". But Judge Geoffrey Robinson rejected their appeal and said in his ruling: "In my judgement it is obvious no developer would be prepared to undertake the task of developing a site such as this without being guaranteed vacant possession of all of it." Speaking after the hearing, one resident said: "It's disappointing. I thought we had a good case. I just hope we can appeal." Jim Steinke, cabinet member for neighbourhoods and community safety, said: "We need to enact the decision that's been given today but I think that we will do that in a human and common sense way. "I would hope that people move on as quickly as possible, but not in undue haste."